FlowXtreme® Plus is your ALL-IN-ONE filter system that is the ideal replacement system for softsided pools. With the new generation Cotton Tails filtration media pre-packaged in the FlowXtreme® Plus system, your set up time will be a fraction of the time. SUPERIOR FILTRATION - The FlowXtreme Plus comes pre-packaged with Cotton Tails filter media. Cotton Tails combines the convenience of sand filtration with the efficiency of DE systems, filtering your water down to 3 micron. PERFECT FOR SOFT SIDED POOLS - A 1,056 gallons/hour flow rate provides a steady stream of clean, clear water without overpowering your soft sided pool. 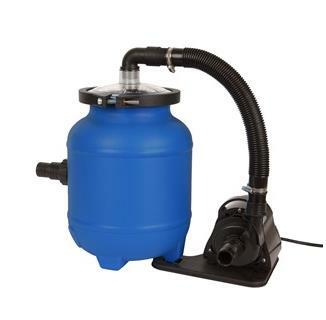 Its dependable, 0.1HP pump filters water up to a max head of 13 feet. A COMPLETE PACKAGE - Why waste time buying multiple components for your filtration system? With the FlowXtreme Plus, you'll receive a high-efficiency pump and next-gen filtration media in one convenient package, allowing for quick, easy installation. 1-YEAR WARRANTY - Your product comes with a one-year manufacturer warranty. Your item will arrive damage free with all necessary parts and accessories. If something goes wrong, we'll work tirelessly until you're satisfied with your product. FlowXtreme Plus is an all-in-one filter system for softsided pools. An ideal replacement for low-powered systems, this energy-efficient filter pump comes pre-packaged with Cotton Tails, the next generation in filter media. Stop wasting time with bulky sand or high-maintenance cartridges. Cotton Tails filtration media outperforms both by filtering your pool down to 3 microns (comparable to DE filter systems). This easy, effective system eliminates the need for clarifiers and reduces time-consuming backwashing. With a 2,100 gallons/hour flow rate, you'll be amazed at the FlowXtreme Plus's efficient, whisper-quiet performance. Replace that leaky, low flow rate system with FlowXtreme Plus Filter System and enjoy cleaner water and trouble free operation. System Includes: Base, Pump, Filter tank, and Cotton Tails filtration media. Backed by a 1 year warranty.